It’s been a just over a month since I have posted here, where the time has gone I’m not entirely sure. 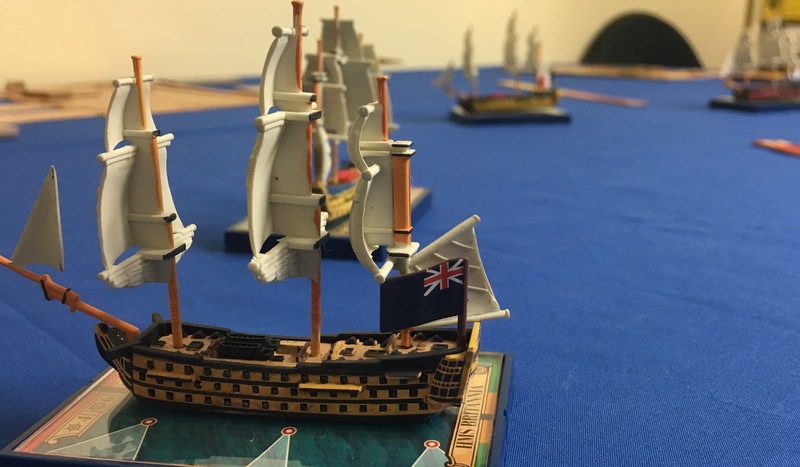 However, yesterday it was the 1st of June and realising that our regular Friday evening gaming slot fell on this date we thought a it appropriate that we mark the famous naval battle the “Glorious First of June” with a Sails of Glory encounter. Below, “Lorde Howe’s Action, or The Glorious First of June” by Philip James de Loutherbourg. 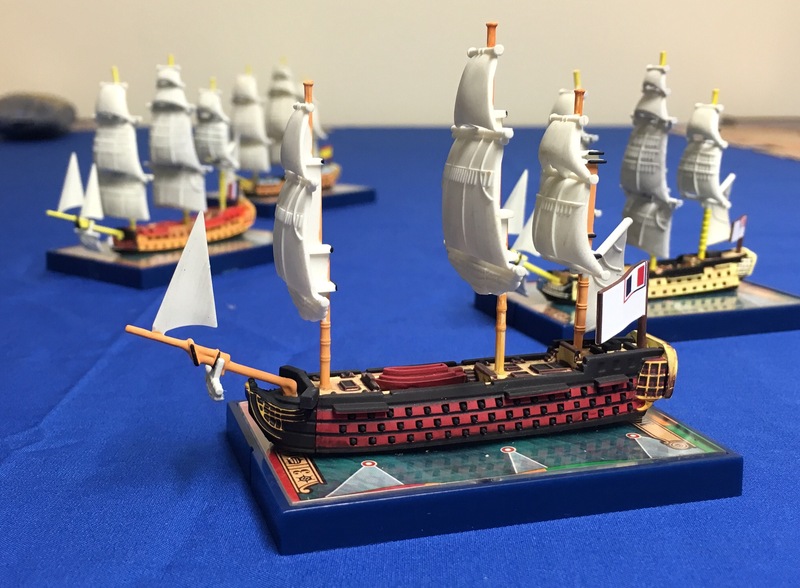 Unlike the actual battle our game would involve only a few ships of the line, which of course it in no way came close to representing the battle. 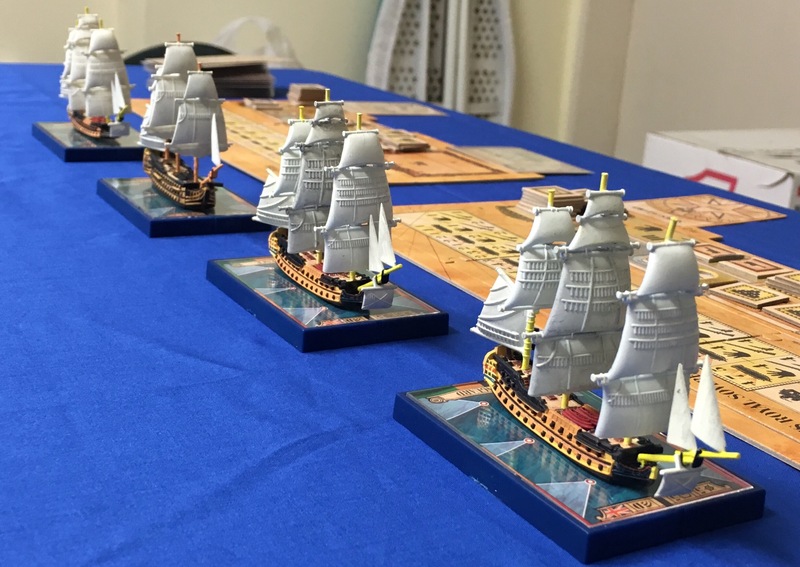 Despite that, it provided an entertaining evening with a nautical theme which involved four players. The British squadron comprised in order HMS Defence, HMS Spaitiate, HMS Bellona and finally HMS Royal George. The first three were Third Rates while the Royal George was of course a First Rate. The French squadron was similar, though a the first ship in the squadron was Argonauta, a Spanish vessel which had recently joined the squadron. She was a late replacement as the one of the French commanders had left his French ships in port (at home). Argonauta was followed by Doguay-Trouin, Le Swiftsure and finally the 118 gun flag Montagne. Both squadrons held a generally southerly converging course with the wind blowing from the north. The British came from the west and the Franco-Spanish from the east. On these courses the advanced ships of both squadrons would come into range first and only later would the First Rates come into range. Aware of this the captain of HMS Royal George, William Domett, determined to act and close the range with speed. The Royal George turned first east before she was hauled back onto the general heading. This closed the range but left her further separated from the squadron and somewhat isolated. Soon the HMS Royal George, with 100 guns, was exchanging broadsides with both Le Swiftsure (74 guns) and the Montagne (118 guns). Royal George was heavily damaged in the first exchanges suffering damage to her hull and a fire which was to cause significant damage. Her crews were focussed on pumping, undertaking repairs and of course fighting a raging fire. Her captain therefore ordered her to increase the range and hopefully regain the squadron. Above, the French on the left and British on the right. The Royal George has begun to close the range but is not yet in range. Simultaneously the Captain of the Spanish ship Argonauta executed a series of turns in an attempt to cut the British line. The Spanish captain however miscalculated and soon the Argonauta, followed by the Doguay-Trouin, we’re heading directly into the British line. Aboard HMS Defence Captain James Gambier had ordered double shot to be loaded and as the Argonauta came into range she was hit by fire from both HMS Defence and HMS Spartiate. Above, the Argonauta closes the range while the British ships prepare to fire. Here, the British ships are just out of double shot range. HMS Defence and HMS Spartiate are on the right. In just a few minutes Argonauta, that once fine Spanish vessel, had suffered the loss of two masts and her crew would be overwhelmed by fires while she took on water below decks due to a hull breach. The Spanish captain’s efforts were not totally fruitless as she would deliver a full broadside into HMS Bellona. 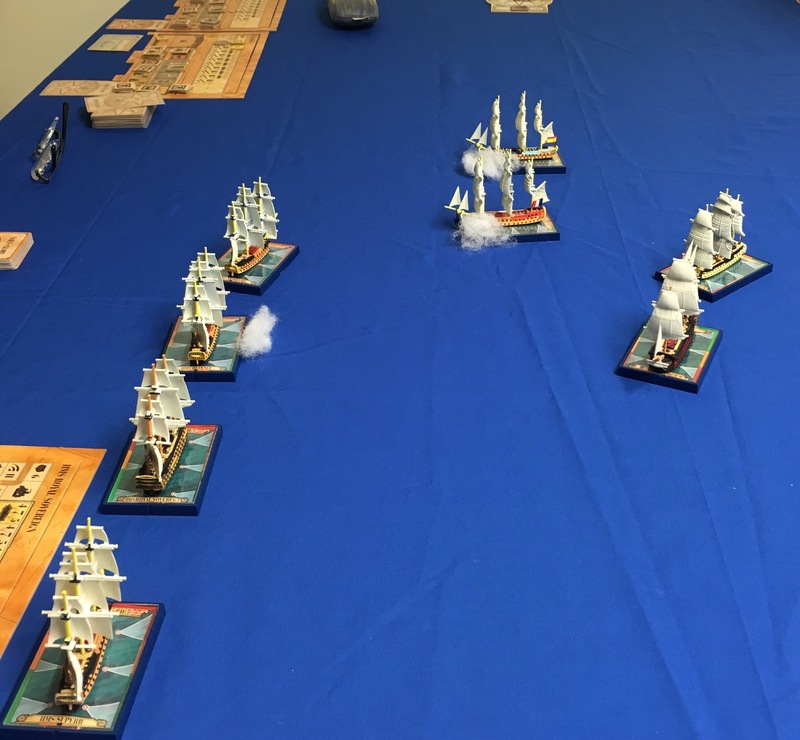 Above, the British unleash their broadsides on the luckless Argonauta. The British ships from the right foreground are HMS Bellona, HMS Spartiate with HMS Defence in the right distance. The Argonauta, in the centre, is followed by Doguay-Trouin. Captain Gambier now bought his two ships south of the Argonauta and, having reloaded, continued to fire at the Spaniard until she was finally overwhelmed. Meanwhile, the battle at the rear of the squadrons was reaching a climax. The Royal George had manoeuvred to increase the range but her movements were insufficient. Captain of the Montagne, Rear-Admiral Villaret-Joyeuse, watched from the bridge as Montagne, Doguay-Trouin and Le Swiftsure delivered broadsides into the Royal George at extreme range. Above, HMS Royal George is in the right foreground while the French ships are on the left with Montagne on the extreme left and only just in range. The Royal George was in an impossible position while under fire by three ships. Her crew, who had only just bought the fires under control, watched as two masts crashed down and her remaining sails were riddled with holes. She was dead in the water. If that wasn’t enough another fire broke out. 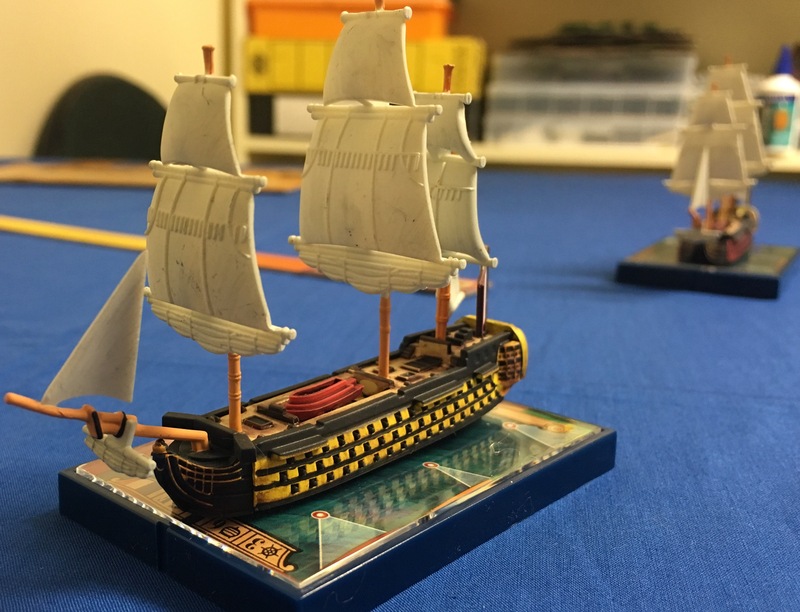 Faced with a disastrous situation HMS Royal George struck her colours. Yet despite the turn of events the French squadron was itself in trouble. The loss of the Argonauta caused a lack of room to manoeuvre. Le Swiftsure and Montagne reduced sail, having previously increased sail to catch the Royal George, in a desperate attempt to avoid a collision with Doguay-Trouin. Alas it was not to be. As the French squadron attempted to reorganise itself the remaining ships of the British squadron, less the Royal George, broke off the action and fell back to the main fleet. That is of course where we ended our game. An enjoyable nautical evening and a great way to mark the date of this famous battle. 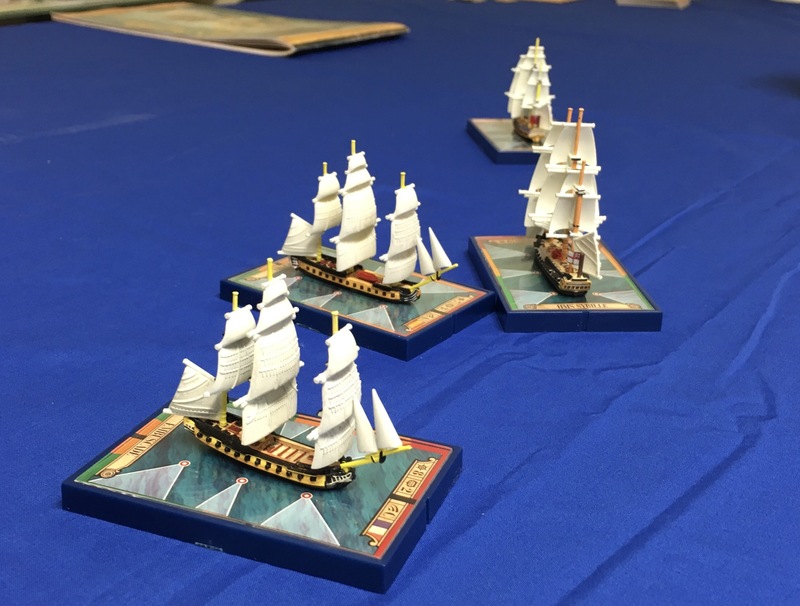 It’s been a while since we have had a Sails of Glory game here but last Friday evening three of us gathered for a small frigate action. I took the opportunity to use the Spanish Ifigenia, a model I’ve had for a while but untested in battle. I won’t try and describe the battle in detail, but in general terms there was, as usual, some jostling for the advantage of wind before the two squadrons were fully engaged. Of note both the French Embuscade and Spanish Ifigenia were outgunned by HMS Unite and HMS Sybille, yet the allies approached the British fighting to gain a better position. Wind has an important part to play it would seem in the age of sail. The French Embuscade was first to fire and unleashed a broadside on HMS Sybille, who returned fire with equal determination. At the same time the Spanish Ifigenia exchanged broadsides with HMS Unite. However, at this point HMS Unite critically lost a mast. Her captain now struggled to manoeuvre her while undertaking temporary repairs. Critically, HMS Unite was effectively out of the action for a short period. Yet not all was going well for the Dons. Miscalculating the enemies speed Ifigenia moved too close to the larger HMS Sybille and the two ships became entangled. The British seemed prepared to take advantage of the Spanish error. The Spanish marines however fought with great determination. Accurate musket fire caused increasing casualties on HMS Sybille, soon they would become critical. The French Embuscade, who manoeuvred close to the wind, now also came about. Together Embuscade and Ifigenia delivered further broadsides the former with solid shot while the later with grape. The casualties again fell mostly among the crew of the King’s ship. Now the Spanish crew, emboldened by imminent success, poured aboard HMS Sybille. Unable to withstand Spanish steel the crew capitulated, providing Spain with a wonderful prize. It was a most glorious day for Spain, and perhaps our French ally! “We’ll take him first! 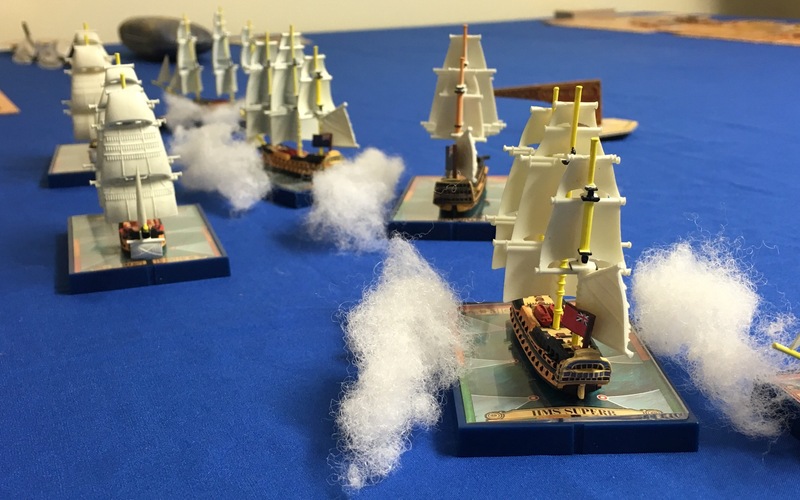 Stand by Larboard battery!” Captain Herrick noted Soames hurrying down his lines of guns as the gun captains crouched like athletes behind each breech, trigger lines taught as they peered through the open ports for a first sight of the Spanish Argonauta. 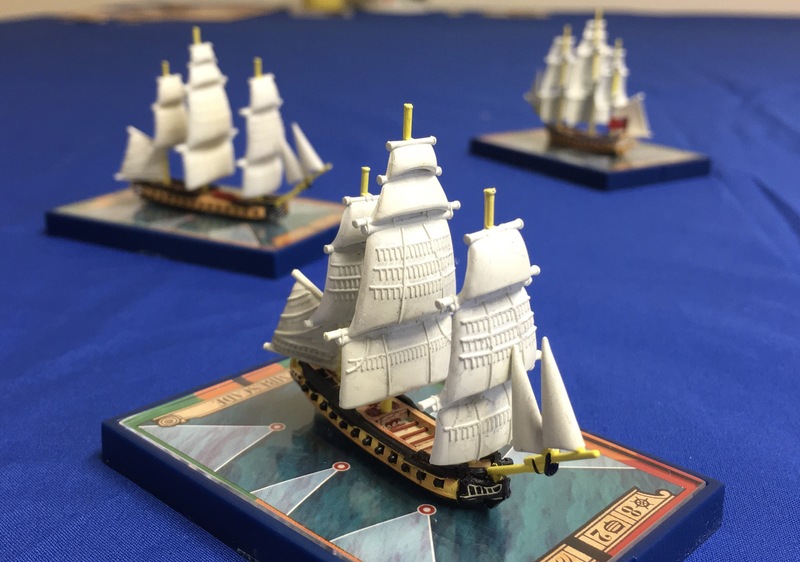 After a very busy week it was pleasing to finally be able to deploy some models on the table and last night it was a multiplayer Sails of Glory encounter. 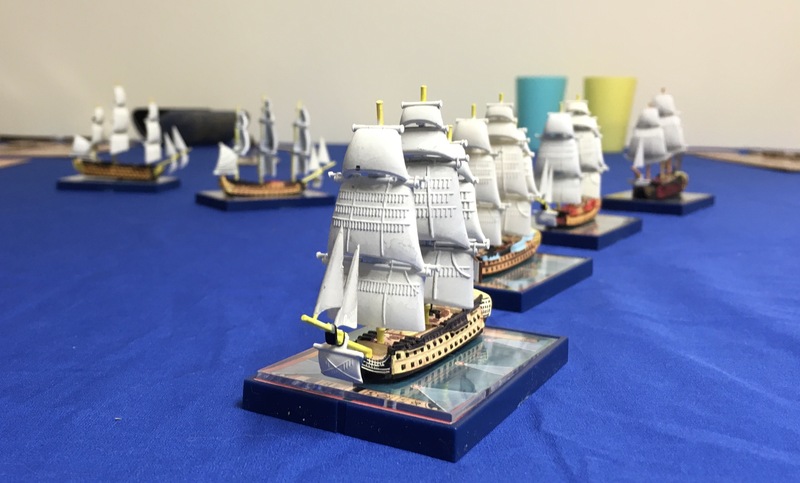 We opted for four ships per side with each player commanding two vessels. The French fleet comprised comprised the 1st Rater Commerce de Marseille and was supported by two French 3rd Raters the Aquilion and Le Berwick and reinforced by the Spanish Argonauta. On a converging course was the British fleet which comprised HMS Victory and supported by three 3rd Raters, HMS Imperteaux, HMS Spariate, HMS Bellona. Two of the British ships, Bellona and Imperteaux were classed as having “Well Trained Gunners” special rule. Each squadron sailed in line astern the British due south while the French south west on a course which potentially had the led ships intercepting if each squadron held their bearing and speed. Further, both admirals determined retain their 1st Raters at the rear of the line. Soon the British squadron broke formation with HMS Spariate and HMS Bellona attempting to manoeuvre to a position that would cross the French line while HMS Imperteaux and HMS Victory would travel behind the stern of the French ships. However, the French ships had a faster turn of speed, due to their attitude. As a result who would cross the T first was in doubt for some time! Above, the French squadron in line astern led by Aquilion. However, we will look at the engagement against the rear of the French squadron first. As the British ships turned from their southerly bearing to an easterly bearing HMS Victory was masked by HMS Imperteaux. As a result Le Berwick and HMS Imperteaux alone exchanged broadsides, which was soon followed by another exchange by HMS Imperteaux and Commerce de Marseille. It was here that the well trained gunners of HMS Imperteaux delivering two broadsides in quick succession. At this point the ships of the rear section were travelling on divergent bearings and would therefore soon be out of range. However, HMS Victory was able to deliver one broadside, her only one, at long range. As a result Commerce de Marseille suffered a leak and broken mast, a result which kept her damage parties busy for some time and prevented her engaging the other British ships. Below, HMS Imperteaux is engaged by Le Berwick and Commerce de Marseille. HMS Victory is on the left rear. Above, HMS Imperteaux is engaged by Le Berwick and Commerce de Marseille. HMS Victory is on the left rear. Below, another view now including Argonauta. Meanwhile the action at elsewhere had been dramatic. Aquilion and the Spanish Argonauta were set on a converged course with HMS Bellona and HMS Spariate. As you will recall who would cross the T of the other was in doubt for some time and the ships exchanged broadsides as they approached. Below, HMS Bellona moves to cut the T of the French squadron. However, at the last moment and under full sail, HMS Bellona crossed in front of Aquilion and Argonauta. 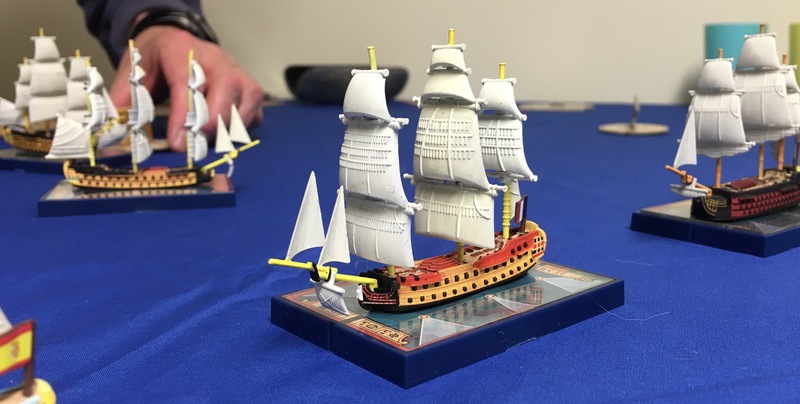 It was at this point both British ships unleashed devastating broadsides on Argonauta who suffered a series of leaks and lost three masts in a single turn. Crippled she was forced to strike her colours almost immediately. The action now became a confusing melee between Aquilion and the two British ships HMS Bellona and HMS Spariate to which Le Berwick soon joined. 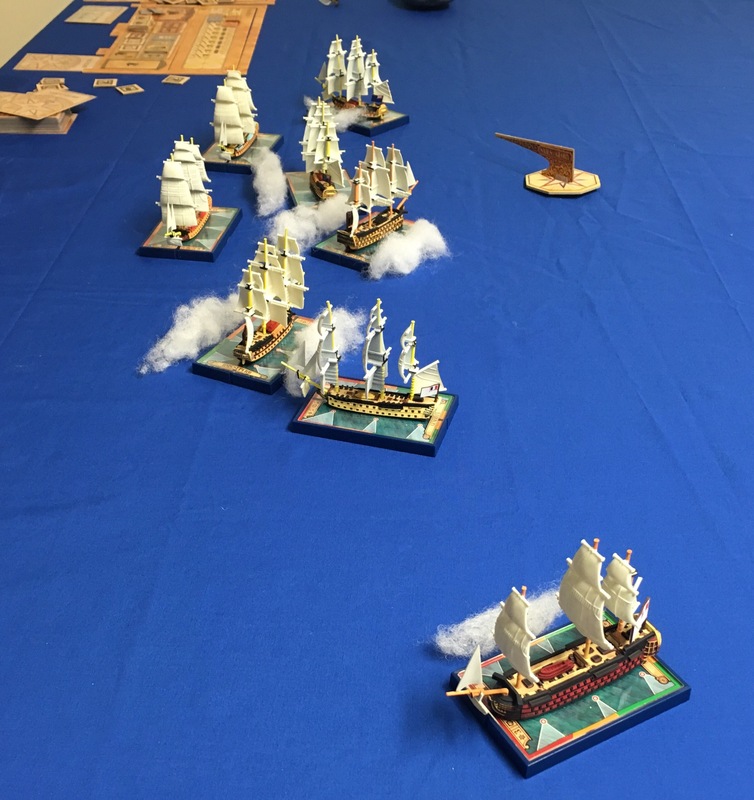 Broadside and musket fire enveloped the vessels for some time. In due course casualties aMong the crew of HMS Spariate became crippling. Indeed, HMS Spariate struggled to manoeuvre the crew losses were so great. However the French Aquilion to was in trouble. With fires and leaks soon out of control another proud French ship was lost. It’s been a while since I have posted here as I’ve been somewhat distracted getting a Macedonian and Punic Wars underway. You can find more on the Empire Campaign here if you are interested. In between playing rather a lot of Ancients games I’ve managed a few Renaissance encounters as well as a couple of Napoleonic battles using Volley & Bayonet. Clearly too much time playing games to post here, a real problem I’m sure. 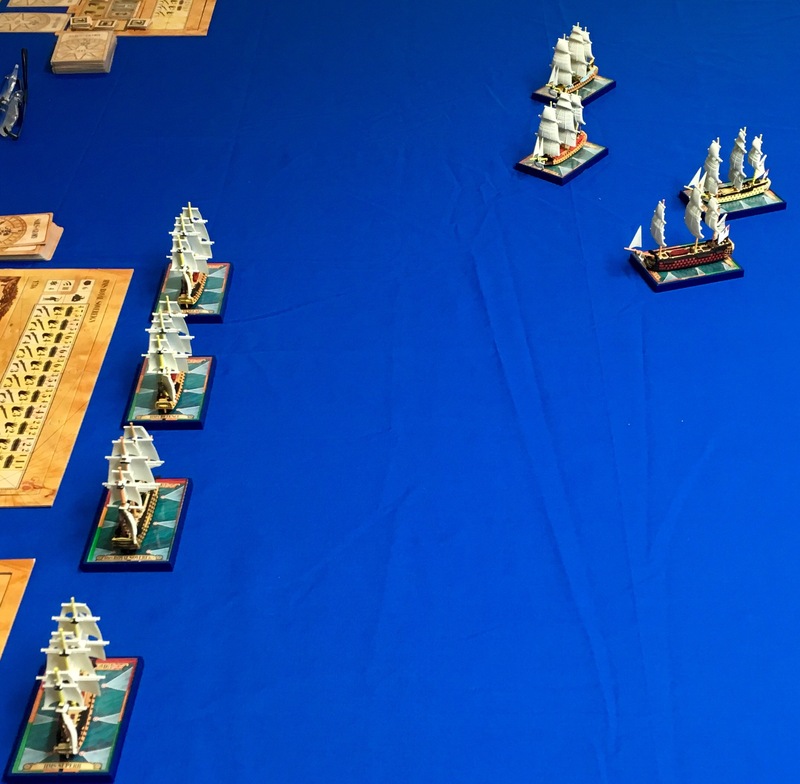 Tonight however, we managed a short Napoleonic naval game using Sails of Glory, it was long overdue. I won’t try and write a detailed report but instead provide a couple of photos. Our game involved the British 1st Raters HMS Britannia and HMS Royal George engaged against the French Orient and Montagne, also 1st Raters. Above, HMS Britannia follows the Royal George around. Both ships carry around 100 guns and have a respectable speed. In the distance the French Orient and Montagne can be seen. Below, another view now of the French squadron with the Orient in the foreground. Both French ships are from the Ocean class and carry around 120 guns. These vessels are difficult to manoeuvre, even compared to 3rd Raters. 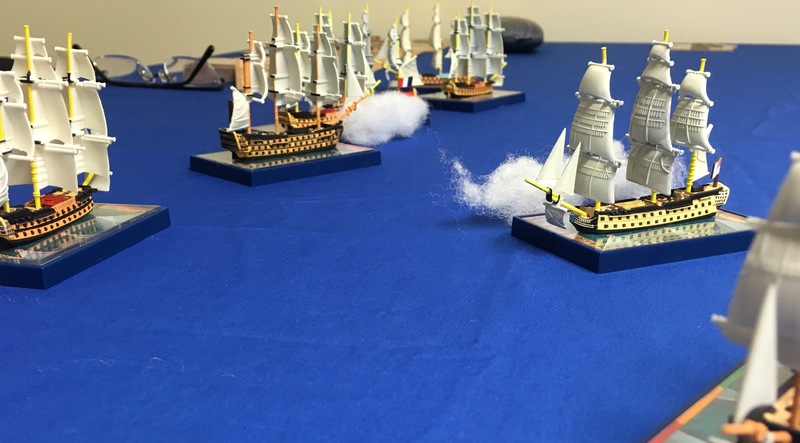 The French vessels managed to secure an early concentrated firing position enabling a couple of solid broadsides where they gained a slight advantage before both squadrons passed each other. Now each squadron manoeuvred for the advantageous position. 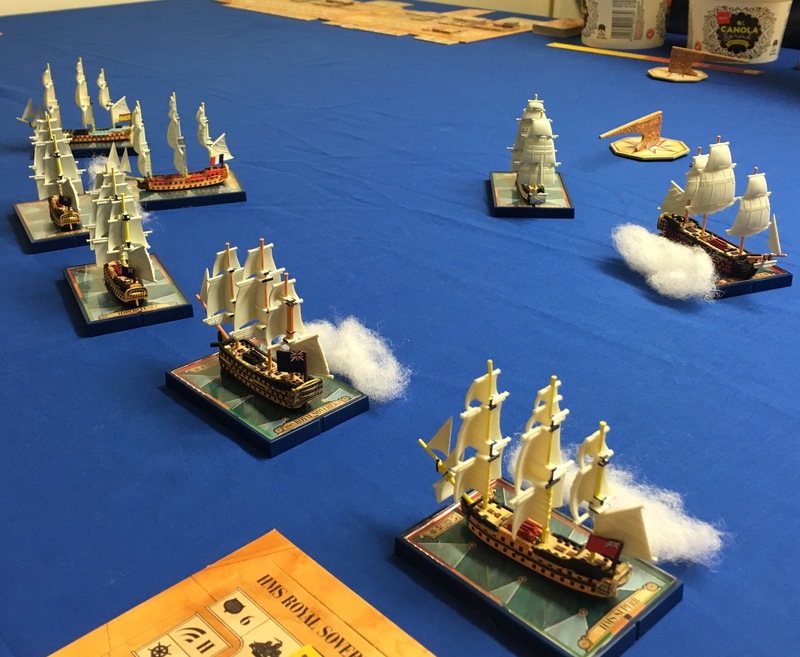 The French ships managed to secure a position slightly upwind of the British squadron. Which found the French ships concentrating their fire again. At the end of this second determined exchange the British squadron broke off with the Royal George heavily damaged. 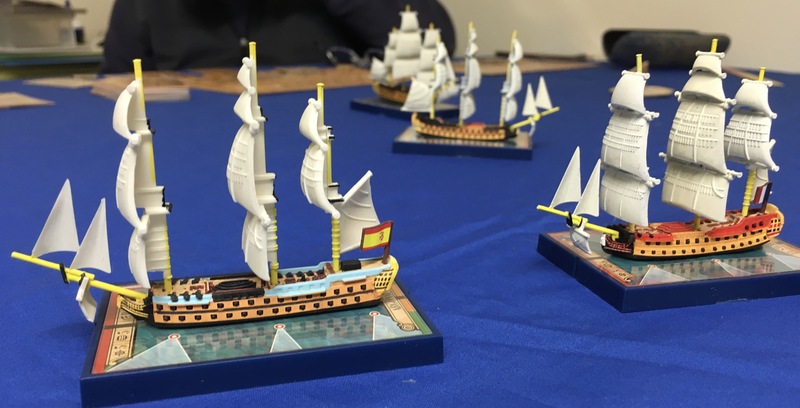 A very enjoyable evening illustrating the playability and challenges of Sails of Glory. 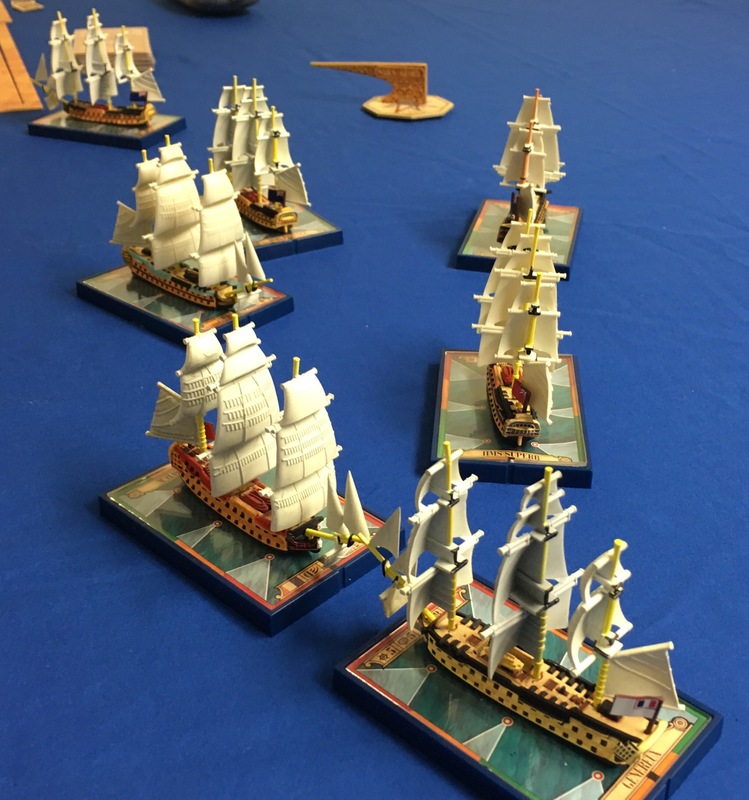 Last night a group of five players gathered for another Sails of Glory game, this time involving eight ships of the line. It was also our largest game to date. Three of players commanded two ships while two players, one who had not played Sails of Gory before, commanded one ship each. Again we opted to use the advanced rules and a selected number of optional rules, though not all. The wind blew from the east and provided some advantage to the Franco-Spanish but during the game it change to blow from the southeast. The English squadron deployed in line astern held a northerly course and was led by HMS Vanguard a 74 gun 3rd Rate ship of the line. Astern was HMS Defence of similar capability. Next was the squadron’s flag ship HMS Royal Sovereign commanded by Vice-Admiral William Cornwallis. HMS Royal Sovereign was 1st Rater with three gun decks and 100 guns. Though slow, she was well able to deliver a devastating broadside. Finally, HMS Superb completed the squadron. Like the other third Raters she carried 74 guns. Below, the English squadron in line astern, led by HMS Vanguard. The Franco-Spanish squadron, also of four ships, had the advantage of the wind and held a southwesterly course. Unlike the English they deployed in two divisions. The advanced division was led by the Montagne. This powerful vessel, and flagship of the squadron under Admiral Villaret de Joyeuse, carried some 1000 crew and 118 guns. She was followed by the Generaux, a 74gun 3rd Rater. To the southwest the second division also comprised two ships. In front Le Berwick, captured from the English in 1795, she formed a critical part of the French squadron and also carried 74 guns. To her stern was the Spanish Argonauta, commanded by Capitán José Antonio de Pareja y Mariscal. Her much maligned crew, suspected by some as being raw by both French and English officers, were actually well motivated and amply crewed her 74 guns. The English plan was relatively simple. Holding a line astern formation they would travel north until finally moving to a slight northeasterly course. The intent was the English ships would in turn progressively pound the Franco-Spanish division of Le Berwick and Argonauta while hopefully bypassing the remaining Franco division. Once their broadside was delivered the English ships would swing to larboard and return on a southerly course. To avoid collisions, in the heat and confusion of battle, much effort was spent coordinating signals so that the turns would be executed in approximately the same location. As the two squadrons closed the split between the French & Spanish Squadron increased. The Franco-Spanish division moved to cut the front of the English line while the remaining division swung first due west before turning on a southerly course. Above, the squadrons close for action. The Franco-Spanish division is in the top right, with the Spanish Argonauta in the extreme top right. From top to bottom the ships are Argonauta and Le Berwick of the Franco-Spanish division. Then Generaux, and finally Montagne the 1st Rate flagship. Montagne would soon swing to the south parallel to the English ships. Below, another view of the Montagne. The Franco-Spanish Division was first to open fire on the HMS Vanguard and HMS Defence. Argonauta and Le Berwick both fired the forward portion of their broadsides. While HMS Defence returned fire HMS Vanguard held her fire aiming to improve her position. She can be seen moving on a north by northeast tack. The French flagship Montagne, bottom right, is well out of range. Below, as the ships proceed and now viewed from the English rear, the squadrons near. Of note Montagne unleashes her broadside on HMS Royal Sovereign. HMS Royal Sovereign and HMS Superb reply with full broadsides resulting in fires and leaks on the Montagne. By the time Montagne had reloaded her guns, and delt to the fires, she would be well south of the English squadron and would fire only one further broadside for some time. Indeed, soon she would spend much valuable time clawing her way north. The Genereux is still unable to fire. In the upper left HMS Vanguard, who held her fire previously unleashes a devastating raking broadside on Le Berwick. Top left the Spanish Argonauta has crossed in front of HMS Vanguard but her crews are busy reloading. Finally, illustrated below, Le Genereux is able to fire and engages, at long range, HMS Royal Sovereign – second from left. While HMS Royal Sovereign can not return, her broadside being reloaded, HMS Defence delivers a broadside. In the various confusing exchanges Genereux was to suffer the loss of two masts, though one was partially repaired. The situation had now become extremely interesting. The Franco-Spanish division had by now crossed in front of, or though, the English line. As such they were east and heading south. The French division was southwest. This of course meant that several English ships were able to fire both broadsides, as can be seen above and below. Le Berwick (on left), with Argonauta astern, hold a southly heading while the English ships fire broadsides from both larboard and starboard batteries. Above, bottom right, Montagne adds her broadside to the melee, engaging HMS Superb at extreme range. The English ships can still be seen in line astern, with HMS Vanguard just coming around to larboard as originally planned. HMS Royal Sovereign is still holding a north by northwest course to avoid a collision with HMS Defence. Despite the concentrated fire on Le Berwick she was not yet finished. She swings to larboard and onto a southwest tack. As the wind had previously swung to be coming from the southwest this would takes Le Berwick into the wind and a heading towards the Genereux. However, as can be seen below, Le Berwick and Genereux are about to deliver broadsides in the stern of HMS Superb. The damage on HMS Superb was horrific. Her hull was punctured in several places and fires overtook the ship. Overwhelmed the damage parties could not prevent her loss. Indeed she was the last ship to be engaged and the first to be lost. Then to add to the list, HMS Defence to was claimed, a casualty to cumulative damage. At this point the fleets began to disengage. HMS Vanguard, barely operational, set a course to the west leaving only HMS Royal Sovereign to the north. She was able to fire a passing broadside at the Spanish Argonauta who, like HMS Vanguard, was a shambles struggling to remain afloat. Genereux was little better. With one mast down and another operating only as a result of temporary repairs she struggled to hold course. Further, another broadside would likely sink her. There effectively remained only the flagships operational. As such both admirals determined to cover the retirement of their remaining wounded squadron. It had been a bloody exchange.